Over the past 7 days we have been taking a look at ProXPN and are pleased to bring you our ProXPN Review. ProXPN offer both a free and paid for service, we have been making use of their paid service and for the purpose of the review we have only made use of this. They offer one paid package type titled the “Premium Account” which is the account used for our testing purposes. The ProXPN website is rather fresh and a nice looking site with a blue and white theme. As with other VPN services that we have tested in the past the critical information is nicely displayed on the front page within easy viewing. This includes the well standardised information about why you need a VPN and the general information regarding what a VPN service can do for you. A small information section on how it works and the other features and benefits. A comparison table is present so you can compare the differences between the free and premium packages. Topped off with contact information and the more important information aspects of any VPN service such as the policies etc. These are within easy access at the footer of the site. ProXPN unlike other providers actually offers a free service which obviously comes with limitations over the paid for service. As explained in the introduction of this review we only made use of the paid for service but the basic differences between the two package come down to connection types, speed, server access, torrent access, ports and support. Strangely the difference between connection types is that on the free package you get access to only OpenVPN and with the paid service you get the ability to connect both with OpenVPN and PPTP. This seemed like a strange offer to make and we would of assumed that the free package should of come only with PPTP and the paid package be the one that included OpenVPN access considering it is the more secure and flexible connection type, alas this is not the case. In regard to speed and server access, the free package has speed restrictions limited to 300kbps and access to only one server in the USA. The premium package allows unlimited speed and access to 9 servers. For everyday use it is well worth considering the premium package as the free package certainly does have its limitations which wouldn’t make it practical for day to day medium usage but on the other hand would still be ideal for those who only need basic access to a US based server on rare occasions. The premium package comes in priced at US$6.25 per month if taking the yearly package, US$8.30 per month if taking a 6 month package and US$9.95 per month if paying monthly. The custom GUI for ProXPN is easily accessed from the “Download” section of the upper menu which attempts to automatically download as soon as you visit the page. There is a link to download the OpenVPN source files and what I would assume the ProXPN config files for OpenVPN also, unfortunately this link is broken and instead returns to the main website. I tried two weeks after my first try to discover this link still broken. 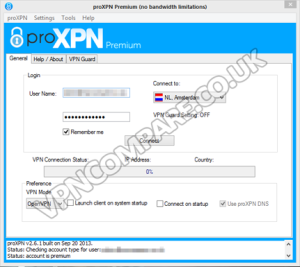 ProXPN offers connection via either OpenVPN or PPTP, there seems to be no mention of L2TP/IPsec which although not a massive issue it seems a shame to miss out basically the second best connection type of the three when they offer the lowest form of security by offering PPTP. That said we are happy to see OpenVPN is supported which for the purposes of the review is what we stuck to, for those who have read my previous reviews you will already know my unwillingness to use PPTP due to the lack of security it offers, those who only have the ability to access PPTP will welcome its availability. The first positive point about ProXPN is they offer a custom GUI for connection. This is basically a standalone program that takes out any of the complicated set-up work for the novice user and makes connection quick and painless. After installation you only need to enter your login and user name which can be saved for future use and then login to enable the ability to connect to servers. The GUI is well laid out and has an uncomplicated appearance. On the right hand side you can select the server you wish to connect to and below this is the connect button. One simple click and a progress bar keeps you informed of the connection progress. Further options include the ability to change between connection protocols, OpenVPN and PPTP. An option to launch the program on system start-up and a final option to connect at the same time if you require. A further option is “Use proXPN DNS” which is currently ticked and unable to be changed, we assume because this option is enabled as standard. Unfortunately the software does not allow you to change connection protocol between the likes of TCP or UDP although you can change the port used between port 443, 80 or 8080. I imagined that the protocol may be able to be changed via a menu option but after a little searching I found nothing. I took a look at the configuration file directly in the system files and manually changed it from TCP to UDP which after testing many other VPN services has always given me better speed results. Although the protocol was changed no connection was possible to be made so I contacted ProXPN regarding this to be informed “we only support TCP connections”. A slightly disappointing response. Although TCP is known to be more reliable, for speed purposes it is sometimes ideal to use UDP especially when speed issues are of a concern and the ability to alternate between the two would of been a nice addition. A good but simple feature of the software provided is the fact that the notification tray area icon changes from red when disconnected to green on connection, this is handy and easily allows you to see your connection status. This feature is something we have found missing from one or two other providers custom GUIs. If the software was to suddenly disconnect for some reason then you could react to this by the visible colour difference in the notification area. One of the best features about the custom GUI is called “VPN Guard” this allows you to add certain programs to basically a kill switch. In essence what this does is if the VPN connection drops unexpectedly or you end connection yourself then the programs you add to the list will automatically be stopped thus blocking any leaking of your home internet connection details to said programs. ProXPN only have a small number of country locations available compared to some of the other players in the market, this is not always a bad thing because if these serve the user base correctly and give a decent service then quality over quantity is always a positive feature. The total number of locations comes in at 9 which unfortunately contains 6 USA based servers leaving room for only 3 non-US servers based around the world. These are located in the UK, The Netherlands and Singapore. Although this is disappointing and we would of liked to have seen more of an even spread it does cover the more essential locations for unlocking services such as Hulu, Netflix, Spotify, BBC iPlayer, ITV Player plus more. More or less most of the best online TV content sites are currently based in the USA and UK so for unlocking a wealth of good TV programs then these server locations are ideal. Those who require a range of US based locations are well served with a range of connection points from east to west coast. Torrents downloading is allowed on the ProXPN Premium plan but not on their free service. I would assume this is restricted to their Netherlands server but I couldn’t garner any concrete details on this from their policies. It may be an idea to enquire as to which are considered “torrent friendly” servers on their network to avoid falling fowl of any of their terms & conditions. I had hoped to test out a custom client for Android and by following the links to their mobile section seeing the “Google Play” and “Apple App Store” logos gave me the impression that there would be an app to download for both Android and iPhone. Sadly upon following the links you are only taken to a set up guide which you must manually follow to make use of the service on your mobile device. This is not overly a huge issue but the absolute tech novice may want to consider if even a step by step guide is too much hard work for them. The next issue in the non app debacle is the fact that instructions are only provided for setting up the rather security lacking PPTP connection type. There are no guides or configuration files available for Android to help with the set up of connection via OpenVPN. For this reason alone I decided not to test the service with my mobile device. My own personal preference is to connect directly via OpenVPN on any VPN providers service, unfortunately ProXPN do not provide any configuration files or certificates which makes the set up of connection to their servers directly outside of their custom GUI extremely difficult for the average user. I contacted their support as I imagined there may be somewhere to download these types of configuration files to be met with the response, “When you install proxpn there is a directory called config.. Generally you can just copy that over the config directory in openvpn clients and then hit connect.” Unfortunately this is not really the case and if the process of this can be achieved with such ease then it begs the question of why ProXPN don’t offer these configuration files directly for download? Although I am a fan of custom connection programs for VPN services due to the ease of access it gives the non-technical minded user, those extra security conscious who prefer to know exactly what is being run on their system appear to be under catered for. Now wanting to give any company the benefit of the doubt (after all technical issues can rear their head at any junction for even the best companies) we opted to come back to testing a little over a week later. In our testing we found no issue with general browsing and simple internet tasks. Unfortunately this is where our ability to praise the service ends. We found downloading to be rather slow, so slow to the point that it was still a third slower than our actual standard ISP connection. This could be due to a number of factors and is not helped by the fact that they do not allow connection using UDP. However even without this ability the download speeds rarely got above 10Mb/s even when making use of a download manager, something which with other VPN providers usually allows us the ability to get up to our full internet speed or at the very least only a 33% drop. I do not feel that a speed reduction of 66% over our normal internet speed is acceptable especially when connecting to two servers which are closely located, one being in the same physical country as us and the other being one of the closest neighbours. Sadly due to this issue we do not feel that ProXPN is an ideal solution to make use of services that require speed, especially if you are downloading files as was the case with ourselves. We tested all three of the non-US based servers for downloading speeds and one west and one east coast connection point of the US based servers. In regard to browsing speed we found no issues. Although as previously stated in the last section of this review we found download speeds in general to be quite poor. As with all our reviews we downloaded a freely available 1GB test file from each of the servers mentioned at both on and off-peak times in the GMT time zone. The download was made via a download manager due to the increased speed this provides over downloading directly in a web browser such as Internet Explorer. Our own internet connection speed is 30Mb/s. The server speeds listed in order are The Netherlands, UK, California USA, New York USA & Singapore and can be seen in the far right column. As you can assess from the above result images the speeds are not comparable to other providers and are rather slow compared to what the competitor VPN providers can provide. It appears that although ProXPN explained to us earlier last week that their engineers are fixing the slow speeds that the problem still remains and it may be an area that they should concentrate on resolving as a matter of urgency as download speeds are of huge importance when selecting a VPN provider. We quizzed ProXPN regarding what encryption their custom software uses when making use of OpenVPN. The following details were provided. 2048-bit encryption key and a 512 bit tunnel. We had a browse through the policies listed on the ProXPN website and couldn’t find any huge issues. The usual policies apply regarding no spamming, hacking etc. ProXPN do allow Torrent access which although isn’t explicitly covered in their policies are mentioned that on their paid for service they are “allowed”, however their Terms of Service does state “We have a ZERO tolerance policy towards any user who might try to use XPN for illicit purposes”. How this should be interpreted is up to you, but it appears as if it is a basic cover for all eventualities. There is a further blurb regarding the fact that because of copyright laws in the US (they are a Dutch company) that copyright holders can contact them should works of been infringed upon under ProXPN’s control. It does not however elaborate on what the outcome of this may be for the end user. Overall ProXPN seem very open and honest about their policies and although not all might be fully agreeable to some users it appears at the very least they are being clear about what is and what is not allowed on their service and also about what they log. We feel although one or two areas could be clarified that they have done a good job on the wording of the policy from an ease of reading point of view. We contacted ProXPN via their support email address on 4 occasions. The first two times on the initial day we went to test their service. We are pleased to say that on the first two occasions at two rather unsocial hours, early in the morning and late in the evening we received responses within 6 and 11 minutes respectively. This was blisteringly fast and some of the most instantaneous replies we have seen from any company, let alone any VPN company. Unfortunately a week later we contacted them again with two different queries. The first response took 27 hours to receive a reply with the second taking a whopping 4 days and 6 hours! Granted, the question was slightly more technical in regard to their encryption types but we didn’t ask for extensive details and a reply of around 19 words really shouldn’t of taken so long to be answered. Had these been more pressing matters like a loss of service or other technical barrier I would imagine it would be quite annoying. A mixed bag in response speeds from ProXPN. Slightly more concerning on the two separate occasions over a week apart we queries both slow speeds and if UDP was an available protocol for speed reasons. Both replies we received contained similar responses with the following sentence quoted verbatim in both emails. “Also please try using PPTP instead of OpenVPN since it is much faster. Two issues spring to mind with the response, firstly suggesting using PPTP instead of OpenVPN is a huge blunder. While it is appreciated that PPTP may be faster, it is also less secure and widely accepted as a lesser encrypted connection type compared to OpenVPN. Comparing chalk and cheese and then making a suggestion on one over the other springs to mind. Secondly, it is slightly concerning that the standard response in this case seems to be scripted, this would lead you to believe that they may be answering certain questions regularly and if one of those questions regarding slow speeds has an already scripted response then you have to question if slows speeds are a regular issue for many customers. Based on the professional looking website that ProXPN provides and the slick custom software for Windows we wanted to love them. Unfortunately this review has been littered with the word “Unfortunately” and for good reason. ProXPN do many things right from an easy to use website to custom software, in 50% of the cases their support was lightning fast. Although after the initial positives we found too many negatives which tip the scales. Critical areas such as speed, support and options fail to impress. The price of the service is average and when it comes to failures on areas like speed with only a third of our own connection speed achieved then even price alone could not make up for this short coming. Support is hit and miss from the instantly fast to the unbelievably slow. Standard features that are available with other similarly prices providers such as the ability to use L2TP/IPsec or connect via UDP are absent which bemused us. Sadly due to the wealth of areas that need improvement we currently would not recommend ProXPN as a contender for a good VPN provider. The base of what makes a good provider are already in place and should ProXPN act on the areas flagged in our review then they could most definitely be a viable option. Part of a companies worth is how they react to criticism and we would be more than willing to retest them once they have ironed out the flaws in their system. Until that point we would currently advise against using their service based on our findings. Tunnelbear Review 2017: A big bear or a little whimper?